Increase the functionality of your shop today with this 6" Jointer with Economy Stand and Built-In Mobile Base. It may be the smallest in our line of cabinet-stand jointers, but this champ packs quite a punch with its 3-knife, 5000 RPM cutterhead speed. Table adjustments along the dovetailed ways are a breeze with a convenient lever-action for the infeed side, and precision handwheel adjustment for the outfeed side. The center-mounted, heavy-duty fence features rock-solid stops at 45, 90, and 135 degrees, and a nice over-sized handle for complete control when setting the fence angle. Table size: 6-5/8" x 47-3/8"
Knife size: 6" x 1" x 1/8"
Approximate shipping weight: 252 lbs. I bought this a month ago and have used it almost everyday since. Does a great job no issues with assebly of the Jointer, however the knock down stand was a different story alignment and part fit was not very good. We managed to get it together and moved on. I would spring for the GO814 next time because it comes with the base and very little install required. All said and done the Jointer is a dream come true concerning always having the capabilty to true up my material. the Jointer works perfectly. I had difficulty with alignment of the stand screw holes and had to shim the outfield table due to board tapering but now it runs flawlessly. A couple of hours for assembly and fine tuning and it was off to the races. My only issue is the location of the depth gauge on the infeed table. Its hidden behind the locking lever. I highly recommend this product. Also grizzlys customer service is outstanding. 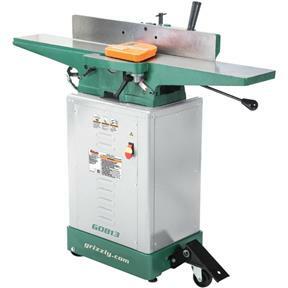 The G0813 jointer was a huge upgrade from the old hand-me-down 4 1/2" Sprunger I have been using the past 21 years. Moving from a 30" bed to a 48" bed makes feeding long material so much easier. The fence is rock solid too, as opposed to the rather "Sprungy" one on my old jointer. Motor runs smooth and has power to match the 6" width for bigger jobs. Assembly was straight-forward with no drama. I did have to file a slight burr off the leading edge of the outfeed table to keep material from catching, but that was a very simple remedy. This is my 4th major tool from Grizzly, and I have not been disappointed yet. Granted I do not have too many high end tools, I love this one. For the price, it meets my needs completely. I only do projects on weekends and some week nights, so I don't get in the shop that often. I do think that it is worth saving the money and getting the know down stand. It took me 4 hours to get everything set up, but being a weekend warrior, it's kind of exciting setting up a new tool. There is a very heavy anti-rust gel on all stainless parts. It does take some elbow grease, but as it states in the manual, let it soak in mineral spirits for a good 10-20 min before wiping it away. I should've let that stuff soak while putting together the stand - it would have come off a lot faster. One thing i did notice is that the dust chute attachment isn't lining up with the holes at this point. It is probably user error though. But this is the drawback of buying the knock-down stand. You are bound to make one mistake while putting it together. 1. The indeed table elevation scale is not readable because it is located behind the blade guard post receiver torque spring knob. 2. Was unable to align some base holes. 3. The fasteners were not high alloy strength and drive pockets cammed out. Would be better if screws were hex hd straight or sheet metal screws. Some panels need to be removed for adjustments or belt replacement. I bought the jointer about a month ago and have really enjoyed using. I didn't even have to set up the knives on the cutter head. I did adjust the out feed table but that was it. Perfect square cuts and very smooth. The only reason for the 4 stars instead of five is the knock down stand is a pain to assemble. I left most of the screws a little loose as I assembled and still had to use bar clamps to get the final holes to match up enough to screw together. Another reason is there is no degree scale for the fence if you need to go between 90 and 45. One other reason is the depth of cut scale is behind part of the guard assembly which makes if very hard to read. But I guess for the price it was worth it. Great value for an excellent piece of machinery. This is my third grizzly purchase and will continue to buy due to quality and price. havent put her through the paces yet, so far w/ light work overall the mach. is good. Some rusting on table and ways even after sealing w/ silicone the wax. The cabinet assymbly can bea little tricky, as having to remove panels after the jointer is mounter the screwws get bound and can strip when having to remove to finalize the unit as one. I am very satisfied with the jointer purchase. Machine is well built. Next will be to purchase the spiral cutter head. The knock down stand is not recommended. Holes do NOT line up well. This makes assembly a little frustrating knowing how much you just paid for this machine. Spend the extra $100 and get the model with the base already constructed. This jointer assembled efficiently because of good design. Ive been using it for about a month and am pleased with its performance and accuracy. My new workhorse, saves me time and makes for better end results. This is a wonderful product for the price. I will be buying more tools from Grizzly. It was easy to assemble, all the pieces parts were there and the instructions were clear. Once I got used to using the tool properly it is everything a jointer should be. Thanks for making good, affordable tools for the rest of us. I bought this a month ago and I'm so glad I did. Exceeded my expectations by a mile. The jointer was delivered within a couple days. There was no damage whatsoever to the packing. The driver was very helpful. The truck had a lift gate but it wasn't needed. The only issue I ran into is a couple of the screw holes for the exhaust port did not match up with the panel nor the plastic exhaust port. The other two screws still hold it securely. Go ahead and have a rust preventer (examples in manual) on hand before you remove the protective coating on the bed and fence. Any humidity will make the bed and fence flash rust. I have found that cleaning the bed and fence with steel wool then coating with Johnson's Paste Wax is all I need to prevent rust. However, do not buff the wax after applying; leave it thick until ready to use again. You must weigh whether you value your money against your time and frustration more. The knock-down stand took me a few hours to assemble - the instructions weren't the easiest to interpret. The G0814 comes with the stand already assembled. It is hard to tell if your stock is truly square if it is small stock, like a 1"x6". I bought a scrap piece of 6"x6" from the building supply. The 6"x6" has plenty of surface area to lay a square against to check if the fence is 90-degrees to the bed. Setup is a pain, as with any other jointer. I am happy so far with the G0813. Assembly was straightforward and took a few hours. On initial startup I noticed a fair amount of vibration on the table particularly at the ends. I called Grizzlys tech service and didnt get get a lot of help. I double checked the alignment of the belt and pullies - they were properly aligned. The bearings were secure. After some research I replaced the belt with a link style. This helped some but did not completely solve the problem. The jointer is very usable and provides clean edges but wont pass the nickel test at the edge of the tables. I had a Delta Shopmaster jointer that I bought new over 20 years ago and it worked fine for standard jointing, but rabbeting was a big pain! Also, the dust collection setup was completely inadequate. After much research and shopping I finally pulled the trigger on the G0813. This is my fourth Grizzly purchase. It arrived super fast (3 days?) and I spent the rest of the day and into the evening assembling. It would have taken less time but halfway through the cabinet assembly I discovered I had put the dust chute/motor mount in backwards! The assembly instructions could have been more clear on that! (Thus four stars) So, back to square one, this time with a little more insight. A couple hours later I had it assembled and in place. The first cut was impressive! Clean, smooth, and dead-on straight! I'm hoping the rabbeting feature works well - I'll find out soon. And dust collection is very good! I still have some tweaking to do, but I expect to have a long happy relationship with this recent Grizzly addition to my shop! The top plate of the stand was not manufactured properly and I am waiting for a replacement. Attachment of supports to the top plate is step 1, so I have not gotten very far in the assembly. If I had a do-over, I would have bought the version of this jointer that did not require assembly of the stand. The screws that hold the stand together are very poor quality. They have Phillips heads, are very short, and the heads strip very easily. Additionally, assembly requires a stubby screwdriver because there is not enough space for a longer screwdriver. Thus, it is difficult to fully tighten the screws. This is a great jointer though it was time consuming to assemble. The KD stand has lots of parts, no captive threads and required too much time and effort to assemble relative to the savings available over the non KD version of this tool. The unit does an excellent job. The only drawback is that the depth scale is difficult to read where it is placed. You have to kneel down as the scale is hidden behind the guard spring. Make sure you follow the stand assembly instructions in the proper order, if you don't, you will get to do some things over. Compared to every Home Depot or Lowes offering, this was well worth the slight difference in price. This is a real tool. Took a while to put together and you do need another person for final assembly. Squaring the fence was relatively easy. Love the cast deck. Once you get the infeed and outfeed tables adjusted, running wood through it went flawlessly. Would buy again. Same accuracy and performance of brands costing much more. Well built. Great jointer for the price. A bit of a pain to put together. Shipping was fast and packaging is good. Runs smoothly , quiet and has plenty of power. Dust collection works really well. Only gripe would be the belt is hard to get even tension on the way the motor is mounted. They could do better on that. Overall though I am very happy with it. I would recommend this jointer to anyone. 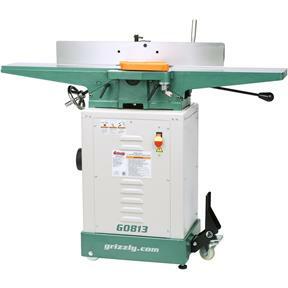 I have several Grizzly products (most recently the G0555LANV bandsaw) and have been happy with the value so far. This isn't the case with this jointer. There were significant machining issues that prevent the cabinet from being assembled without the use of a dremel to resize bolt slots. Underneath the jointer itself, some of the powder coat was missing, and this area had significant rust. Also, the jointer table itself had pitting at the very end with associated rust. I was able to remove the rust but the pitting is of course permanent (this is at the very edge of the table and doesn't affect the use of the machine, but it's a quality issue none-the-less). Works great and very heavy table. For the price we couldn't have gotten a better product. Love the mobile base too. Good value for the money. Only thought about the assembly of the piece is that the manufacturer could use hex head screws instead of slotted so you could use a driver to put the m in vs. a hand screwdriver in the assembly. Once again a quality product by Grizzly added to my shop! The jointer I purchased from Grizzly happened only after a lot of research and gnashing of teeth. The decision was made on price initially, but receiving my order in two days was a great start. Unpacking and assembling showed a good looking machine that is a show piece in my shop. But the critical test was when I ran my first piece of walnut through and saw the silky smooth surface with no snipe! I will look to Grizzly first for my future needs. I have only had the opportunity to use the jointer once, but it works well. I had some difficulty getting the screw holes to line up between the left side panel and the chip exhaust chute, a lot of parts to align. My main problem was with the delivery. I was not notified by the shippers, so was not at the delivery point to load into my truck, since my house is not accessible by large trucks. The shipment was left in a warehouse and I had to round up volunteers to help load it, not what I expected after paying $35 for lift service. Also, while there was only a small chip on one corner of the feed table, the shipping box was heavily damaged (see attached photos), suggesting careless handling. Assembly was very easy. Works very well, already made a butcher block work bench. If you do a lot of edge jointing occasionally move the fence as the blades wear faster than expected or get a second set. The only complaint I have is that the depth gauge is behind the table lock and you need to crouch to see it clearly. Rabbeting was quick to set up and cut very cleanly. Update... on 3/8" x 3/4" rabbets the angle stop hits the drive belt. You either need to remove the jam nut or clamp a board to the fence. The machine itself is great and I'm really glad I got it, but assembling the knock down stand was a real headache. Several parts of the assembly instructions were unclear and I spent several hours trying to get it assembled, including multiple partial disassembles to correct mistakes caused by unclear directions. Do yourself a favor and buy the model with the cabinet stand. I wish I had. I've now had my jointer for about 5 weeks and couldn't be happier. I haven't set it up yet with a straight edge yet but I have ran some ash through it just to see how clean it cuts and I'm impressed. 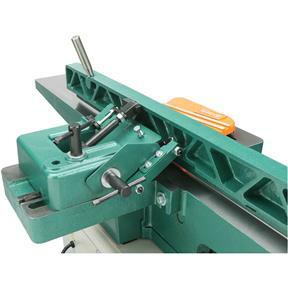 This jointer has a tremendous value at an awsome price point. I'm looking forward to getting my straight edge and feeler guages in so I can set it up and start on a new project. Only gripe with the whole process was working with the people grizzly uses for shipping. No one I talked to had a real idea of what was going on. But the people at grizzly were awsome and eager to help. Thanks. 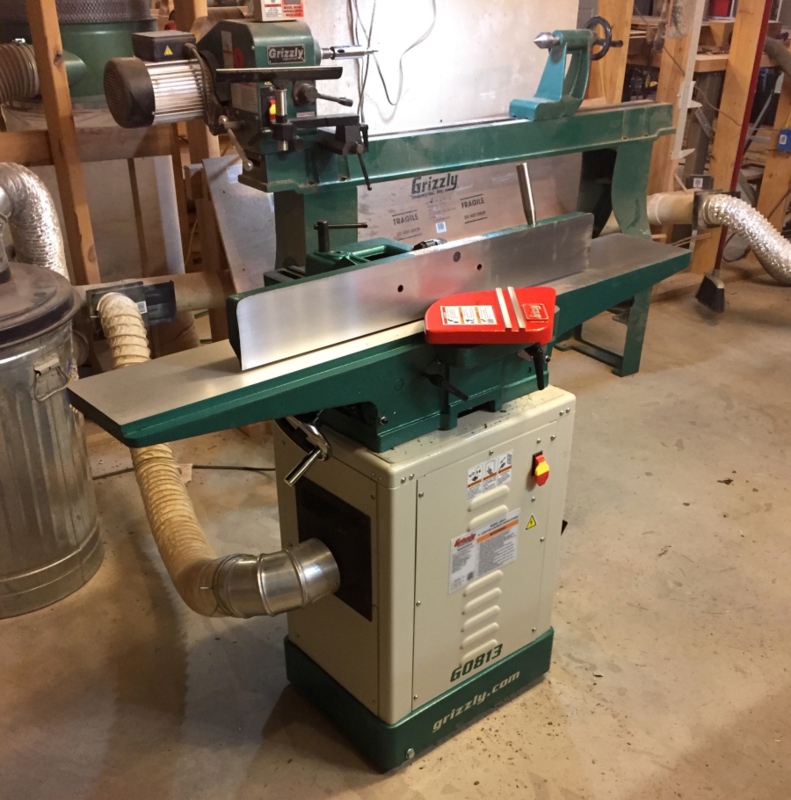 I bought this after my previous 25 year old jointer failed. The jointer came as advertised and was relatively easy to put together. Two strong people are required to assemble the heavy parts. After using my previous jointer for 25 years I was surprised at the low cutter head speed of this jointer. It makes a good square edge if you push your stock through slowly. However, the cutter speed is too slow. 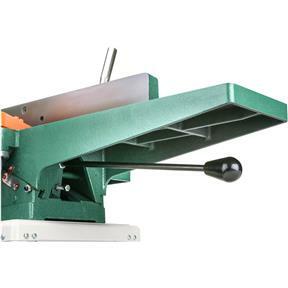 I bought this product a little while ago and I am very impressed with the quality and performance of this jointer. It is well made and easy to assemble. I have always wanted a jointer for my home shop and this fits the bill perfectly. Great product. I'm so glad I waited for this backorder to arrive. This is a high quality product. This jointer is great for a small hobby shop like mine. I am completely satisfied with my purchase!! I bought the G0813 jointer to work with some old reclaimed oak lumber that I'm making into a dining table. It has made the project so much easier. The cuts are accurate and smooth. I don't know why I waited this long to purchase a jointer. And on this model, the price was right in my budget. 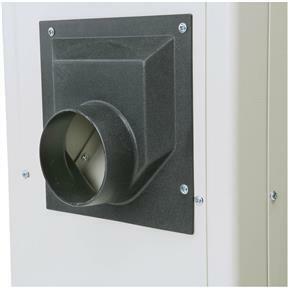 I also coupled it with the G1163P Portable Dust Collector and W1049 2 Stage Cyclone Seperator. This is an excellent combination for my shop. Dust and dirt has been reduced considerably. I love this machine. It comes with wheels built in to make it easy to move when needed. Very well built with easy adjustment lever and set up jigs for fast replacement of the knives. It has a very nice cabinet stand that allows simple attachment of a dust collector. The jointer arrived in good condition. Assembly of the base was somewhat of a pain but I kept reminding myself that I saved a few bucks. (If you are not blessed with boundless time, energy, and patience, buy the G-0814 model and let the good folks at Grizzly do the assembly.) The machine runs quiet with minimal vibration. I have now used it to edge joint boards for a glues up table top. The jointer works very well for me and I expect it to continue to do so for a long time. It is a good basic machine at a fair price. I have run about 600 board feet thru with no issues. 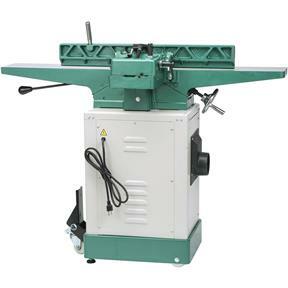 I bought the previous model of this jointer. I love everything about it minus the fact it will slide across my floor while I'm operating it. I'm considering taking the wheels off of it and making it stationary. Nutshell : I am very happy with the purchase. Grizzly really got the big things right, but may have sacrificed some of the smaller details for the sake of an affordable price. I would dock the machine a half-star if I could, but a 4-star rating seems too harsh. All-in-all, great machine that is worth a look for the budget-conscious woodworker. Assembly of the jointer took approximately 2.5 hours to complete. The manual is good enough to provide all the details needed to assemble the jointer without too much confusion, however the images are more useful than the text. This being the case, it would have been nice if the images were larger/sharper, but that might just be the lego-generations preference. 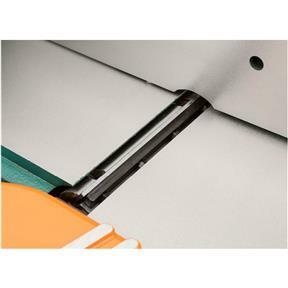 The cabinet portion of the jointer is constructed from sheetmetal with tapped screw holes and slotted clearance holes. This works well enough and provides the necessary clearances to adjust and fiddle so that everything fits nicely. However, only a couple of threads are engaged in the sheetmetal, so if the vibrations from operating the machine start to back out the screws, nylon lock nuts might come in handy. The most difficult portion of the assembly is mounting the motor and tensioning the drive belt. The motor is mounted with 4 bolts through a slotted track. The motor is heavy, so positioning the motor, getting the belt tensioned properly, and tightening down the mounting bolts took the better part of half an hour. Needless to say, while it can be done with one person, an extra set of hands would certainly have made this process easier. The design of the machine is well thought out and executed with only a couple notable short comings. First, the cast-iron in-feed and out-feed tables come flat and coplanar straight out of the box. Based on feeler-gauge measurements with a straight-edge, was about 1-2 mils (0.001-0.002 inches) out of coplanarity, which is good-nuff in my book. Knives are sharp (be careful while cleaning them) and well aligned with the out-feed table. Apart from the belt tension, set up of the jointer was fairly painless. The fence is flat and well-constructed, but the bump-stop mechanism leaves something to be desired. This mechanism is a small metal plate, a bolt and a jam nut. While this is serviceable, it is difficult to tighten the jam nut without changing the angle of the fence. If you are planning on switching between 90 degrees and 135 degrees often, this mechanism would not be good enough to rely upon. Owning and working with this jointer has been a very positive experience. 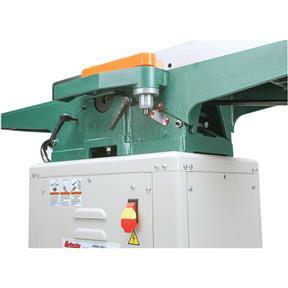 The jointer is much quiet and produces glass-smooth cuts. 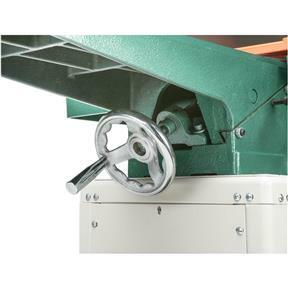 The knock-down base makes the machine easy to move around the shop without reducing stability. In the spirit of full disclosure, my unit was delivered with one of the leveling feet bent. I contacted Grizzly customer service about the issue and they are replacing the part under warranty as soon as the part is in-stock. Working with the customer service department was also a very positive experience. This is the cutest jointer I ever saw! The photos are very nice and the color is exultant! So you gave a machine that isn't even available yet a 5-star rating because it is "cute"? According to a live chat associate, and THIS IS IN NO WAY OFFICIAL, she said on May 23 that "most of these models (referring to jointers) are expected to arrive in July and August '16. If anyone was wondering.